A Custom 1984 Chrysler Fifth Avenue for $4,500? Today's flame and lake pipe sporting Nice Price or Crack Pipe Chrysler Fifth Avenue might have been an odd choice for a custom rod, but at least its 'odd rodder' name pays homage to the fact. It's Friday, and you'll need to decide if this weird ride's price is also worth paying. Before we can get into today's contest, we'll need to wrap up the results of yesterday's vote. As you will recall, on Thursday we had a 1989 Isuzu Trooper that had been opened up in the back like Sasha Grey. That was probably the least weird thing about the truck's presentation- there was also the suspiciously low miles, the 'rebuilt' engine that looked like the picture of dorian gray, and the fact that it was in Canada, I mean what the hell's up with that? In the end, that all was too much for its asking price to handle1, and it fell in a pretty substantial 82% Crack Pipe loss. Sorry Troopers. This Custom 1989 Isuzu Trooper Could Be Yours For $6,500! Hey, how much would you pay to be different? No, I don't mean like Chaz Bono different, that probably cost a fortune. I mean different in the way that others respect and admire you. You know, marching to the beat of your own drummer and all that, but without the shame that typically accompanies unconventional individuality. What do you think that would that be worth to you? Today's 1984 Chrysler Fifth Avenue will help you in letting your freak flag fly, and once we give it the once over, you can decide if its price is worth the weird. Now, it should be noted that the present title holder is looking more for a trade than the cash, but as you all know, homie don't play that. The '80s Fifth Avenue was an upscale edition of the M-body, which was a derivation of the F-body that spawned the rust buckets known as the Dodge Aspen and Plymouth Volaré. Previous Fifth Avenues were trim packages on the ginormous New Yorker models, while the M body was initially branded LeBaron. You know what, keeping track of early '80s Chrysler model name and platform switches can make your head hurt. Your visual senses may also seem under attack by today's Fifth, which has been ingloriously dubbed the 'Odd Rodder.' See, it says so right there on the rear fender. 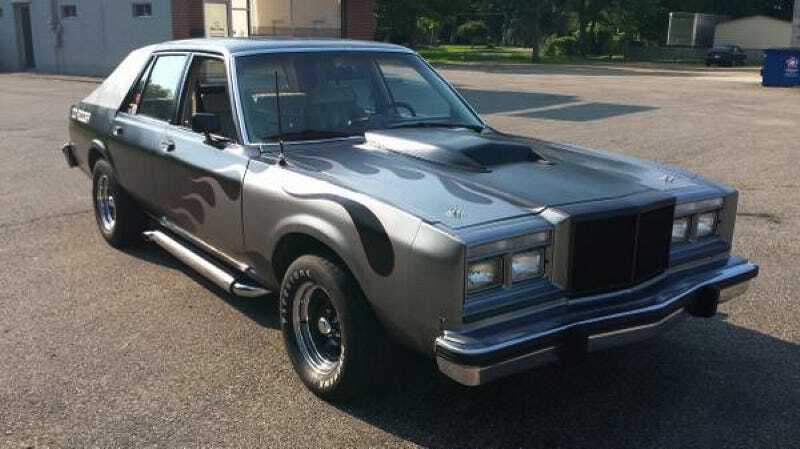 Making this rod so odd are the sail panel extensions in the back, the flames down the hood and fenders, the scoop on that hood, the lake pipes, and the fact that all that has been applied to a freakin' Chrysler New Yorker. Duh hyphen Fuq? On the inside it's equally weird, presenting an odd mix of '60s bordello and '80s dance club. White tufted seats look as comfortable as the ample bosom of an Octoberfest beer maid, and there's plenty of room to stretch out in its five-passenger environment. The ad is light on mechanical details. It does note that the car has 108,000 miles, but there's no mention of what engine has made those possible. In 1984 the only option was a 318 V8 making either 140-bhp (2bbl) or 170 (4bbl), so there you go. The only transmission option at the time was the Torqueflite 3-speed. You know how important it is to stand out in the crowd, and the Odd Rodder will definitely allow its owner the chance to be noticed. The cost of that notoriety is $4,500 (remember, we don't do trades) and you now need to decide if that's a fair price for so odd a rod. What do you think, is $4,500 a fair cost to say you have an odd rod? Or, does this Fifth Avenue's price make a massive road closed sign? Battlecreek Craigslist, or go here if the ad disappears. H/T to Mark McIntosh (again!) for the hookup!